Spring is here so lets brighten things up with splashes of bold colour and pretty origami designs. There are a few variations on why folding a thousand paper cranes brings luck, happiness and long lift - in ancient Japan anyone who folded a thousand origami cranes would be granted a wish by a crane. Today they have become a popular symbol at weddings signifying a thousand years of happiness and prosperity for the couple. Credits: Japanese supermodel Devon Aoki, hanging paper cranes make a stunning backdrop for this chandelier, via we heart it. A bold orange and pink patterned chair by Andrea Mihalik. Origami place cards via the knot. 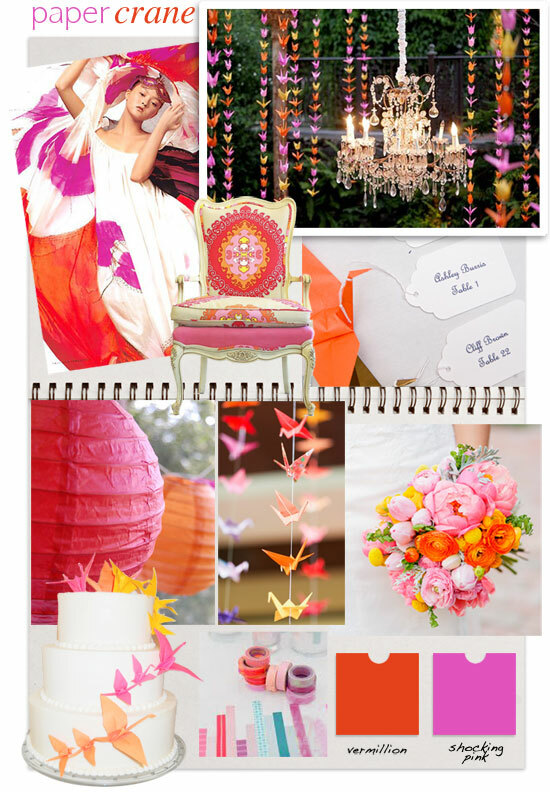 Orange and pink Japanese paper lanterns via Project Wedding. Paper crane wedding cake, via Cakes We Bake. A colourful string of origami cranes via Wedding Chicks. Washi tape table decorations via Santa Barbara Chic. A bold bouquet of orange and pinks via 100 Layer Cake.